There will come a time the next couple weeks when you will no longer be mowing the lawn. When that happens you will want to empty the fuel and clean the lawnmower. It’s a good idea to pop off the blades and have them sharpened. Before putting them back on give them a rubdown with oil to keep them from getting rusty. If there’s are any repairs to make, then now is the time to do that. Don’t wait for spring when you will have already forgotten and they’ll be a rush of other lawnmower owners. It’s time to circulate your gardening tools into the back of the shed and move up your winter equipment like snow shovels and snow blowers. You want them handy at the first drop of a snowflake. If the last power outage during the winter convinced you to buy a backup generator, then now is the time to check it out. Turn it on and run it to make sure it is in good working order. It also helps to buy extra gasoline and have it ready just in case. Be sure you store that gasoline out of reach of children. Your garden hoses should also be drained and allowed to thoroughly dry before you put them in storage. If you have any other liquids in the shed that might freeze, then you should probably take them out. It’s a good time to get rid of any old paint cans and solvents. Organizing your backyard shed is a good habit to get into. However, if that shed is starting to fall apart, then you may be better off tearing it down and replacing it. Just ask yourself, “Will it be standing at the end of next winter?” If you want to get that backyard shed demolished and carted away, then the best call you can make is to Junk King Pittsburgh. Although they specialize in the removal of things like furniture and appliances, the Junk King crews have a lot of experience with dismantling all kinds of backyard structures including sheds. They can also haul away all your unwanted rubbish in the same trip. 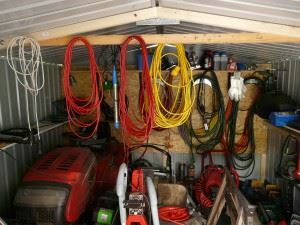 Take care of backyard shed removal and junk hauling the right way by bringing in Junk King Pittsburgh from the start. This entry was posted in junk removal and tagged backyard shed, junk removal, winter on August 28, 2017 by Junk King. Last updated August 28, 2017 .